The trip starts in the town of Sao Tome, upon arrival we will be transferred to our hotel in the centre of town, our base for the next two nights. 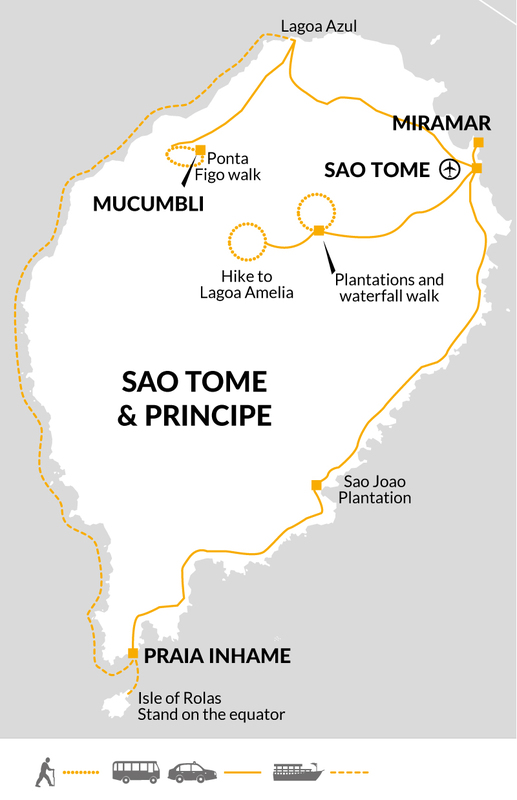 Today we explore the sights and sounds of the small city of Sao Tome. Originally established in 1493, the town gained prominence off the back of sugarcane and the slave trade; it was over the next 50 years that work started on the cathedral and the Fort of Saint Sebastian, the first sight we will visit on the island. The fort houses the National Museum, detailing the history of Sao Tome and the legacy of labour-intensive crops: cocoa and coffee predominately feature too, a reminder of the key part both have played in the story of this beautiful island. We will walk along the seafront to Independence Square, enjoying the hustle and bustle of the town, filled with colourful buildings, street vendors selling jackfruit, and motorbikes buzzing around. After visiting the Mercado and our lunch on a peaceful terrace restaurant overlooking the bay, the afternoon is free for you to rest and visit Claudio Corrallo chocolate factory (reputedly home to the best chocolate in the world). Today we'll take the ocean road, driving through small fishing villages and past beautiful beaches, including a few swimming stops, to Roça \'c1gua Izé, a beautiful old plantation where cocoa production first started. Not far down the road, we'll make a stop at the natural blowhole of Boca do Inferno. A leisurely lunch will be had at the Roça Sao Joao Angolares which, according to our very own Kathleen Becker serves some of the best food in Sao Tome, in the heart of the Angolares community - a fishing people said to be descendants of runaway slaves. After lunch we can take a stroll through the working plantation before continuing south to Praia Inhame. This morning we board local fishing boats and are peacefully steered through mangroves from the town of Malanza. The mangroves are a great place to spot birds including Striated heron, malachite kingfisher and the reed cormorant; we will be out on the boat for around 90 minutes. After elevenses, we will explore the Southern Beaches, including Praia Piscina, an idyllic place for swimming and one of the best beaches on the island. We'll enjoy a traditional Sao Tomean lunch and beachcombing at Praia Jalé, a turtle beach (as are many of the beaches in the area) and a great place to stop for a refreshing Nacional beer brewed on the island. We have an early start today to board our boat to the isle of Rolas and to boldly stride between two hemispheres as we reach the equator! There will be swimming and snorkelling opportunities available this morning to cool off and enjoy the waters. Depending on the weather we will either have lunch right on the beach, where snorkelling is available, or in the village. After lunch, we'll experience a boat journey up the west coast of Sao Tome, on the lookout for endemic birds and marine life. We'll stay close to the coast as we slowly cruise past forest, waterfalls and small villages on our way to Neves town where we go ashore. A short drive takes us to Mucumbli, our home for the next 3 nights. After a fairly busy few days, today there is time to relax and take things at your leisure. We have no organised activities, but our chalets are located above a beach for a spot of swimming, the grounds are a botanical garden, and the panoramic terrace overlooking the sea is perfect for lounging and catching up with a book. For those that want to explore the local area, an optional afternoon 25km cycle will be available with Kathleen and a local guide along the coastal road to Santa Catarina, a bustling fishing village where it is sometimes possible to see a canoe being made by hand. Optional hikes are available with Mucumbli guides. The food served at our accommodation is the perfect combination of local produce and innovative Italian flair. We start the day with a visit to the nearby CECAB organic cocoa cooperative, a dynamic initiative that is helping farmers to gain a fair living and access new markets. From here, a 2-hour hike to Roça Ponta Figo takes us through secondary forest and savannah landscape teeming with birds and past the small community of Generosa, a satellite plantation of the historic Roça Monteforte, which we will rejoin after a short transfer back from Ponta Figo for a local lunch on the plantation terrace. The late afternoon is free to make the most of being so close to the sea or simply enjoy the peace and quiet of our accommodation. This morning we'll leave Mucumbli, take an hour transfer to Miramar to drop our bags off and then we head out of town and into the heart of the island for a varied forest walk around satellite plantations of the iconic coffee plantation of Monte Café, with a chance to take a dip at a waterfall at the end. We can expect to see many of the endemic birds of Sao Tome. After driving back to the mother plantation of Monte Café we will enjoy a late lunch at a family-run coffee producer's restaurant, and there will be opportunity to buy some coffee if you wish to take a little bit of Sao Tome home with you. Tonight there will be the opportunity to visit a dance club with Kathleen, where you can experience the African rhythms of kizomba dancing. Today we drive up to the botanical gardens of Bom Sucesso. At over 3500 feet, the garden is home to over 400 local plants and endemic orchids, but before visiting we will first hike up to the ancient dried-up crater lake of Lagoa Amelia. This classic walk takes us up some 1200 ft through agricultural land to the primary forest of the Obo National Park. During our 4 hour guided walk, our guide will help us spot some of the local birds, including the Paradise Flycatcher, endemic weavers and sunbirds, and the Sao Tome oriole. From the overgrown crater rim, there is the option to make a short steep descent into the swampy crater, rimmed by the world's biggest begonias. Back down at the Botanical Gardens, we will enjoy a picnic lunch followed by a guided tour of the Gardens, learning more about the diversity and many medicinal uses of San Tomean trees and plants. This evening we'll have time to enjoy our final group meal. There is ample time this morning to relax and have a leisurely lunch before we head back to Sao Tome town for last minute souvenir shopping and an exotic ice-cream. We will then transfer back to the airport where the trip ends. With a tropical weather system, Sao Tome and Principe can be visited at any time of the year. Sao Tome's equatorial climate keeps fairly constant temperatures throughout the year. The average high is between 28 to 31 C, while the average low is between 21 to 23C, along the coast and lower lands. The months between June and September feature the cooler end of these temperatures which is also during the dry season. The rainy season from October to May which is humid between the rain showers, also features a sub-season between December and February which has less rain but a high degree of heat and humidity. In land the mountain areas are a couple of degrees cooler at around 20C with the nights being generally cool. Take a small torch, water bottle, sunglasses, sunhat, suncream, insect repellent, binoculars if planning to birdwatch and a beach towel. Bring a lightweight rainjacket just in case. You may find walking poles useful on the uneven terrain during the walks. Accordingly, you should allow €30.00 per person for group tipping. Airport departure tax is approximately US$24 or €20. This is now incorporated into flight tickets issued after 21 Nov 2016. Major hard currencies are accepted in Sao Tome, we therefore advise taking all of your spending money in Euros. Once you arrive on Sao Tome island there will be limited methods to get extra money so please make sure you bring enough with you so that you do not run out. Accepted only at Miramar Hotel. Money transfers can be arranged for Visa/Mastercard credit cards at the main bank in Sao Tome with your passport. Sao Tome: Visas are not required by UK, Canadian and US citizens for stays of upto 15 Days. For stays of 15 days and over a visa must be obtained prior to arrival in the country. Other nationalities should consult their local embassy or consular office. Please note that your passport needs to be valid for at least a mininum of 3 months after the expiry date of your visa. Please note you will be required to supply a yellow fever certificate prior to arrival in Sao Tome if you have travelled from or via a country where yellow fever is endemic. We reccommend protection against malaria, hepatitis A, tetanus and typhoid. Consult your travel clinic for the latest advise on different antimalarial. Please check the latest requirements with your travel clinic or doctor prior to departure. The above is not an exhaustive list. Further information regarding vaccinations and travel health advice can be found by following the NHS and NaTHNaC links at Explore Travel Health and from your local healthcare provider. Visa and vaccination requirements are subject to change and should be confirmed by you before travelling.